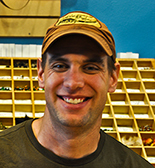 On a recent trip to the spring creeks I was able to sit down with Mat Wagner, owner of the Driftless Angler Fly Shop in Viroqua, Wisconsin, where the conversation turned to some essential trout foodstuffs: scuds. MC: Can you start by explaining the importance of scuds to spring creek trout? MW: Scuds are probably the most important and the most prolific food source for trout within our spring creeks. They are present in different colors and different sizes all season long. Basically, if you have a Driftless area spring creek, you have scuds. An old friend once told me that if you have a size 16 tan scud, and that’s the only fly you have, you will catch fish all year long in the Driftless. MC: And why is that? MW: It has to do with our water here in the Driftless. The chemistry of our limestone-filtered water makes it very, very easy for crustaceans to regrow shells. Usually the process of shedding and regrowing a shell is a very stressful time for a crustacean of any type—not so in our spring creeks. MC: When you’re deciding on a pattern or color to fish, what factors are you taking into consideration? It’s season more than anything else. When you look in a fly shop you see scuds of all different colors, from pink to orange to tan to amber to olive. And those are all representing naturals in various stages of the life cycle. Your standard scud colors are the tan tending to the grey. Certain species of scuds-—such as those that like to live in the weeds instead of the bankside sand, rocks, or silt—-will tend toward an olive color. Now those pink scuds, either all pink or those with a little pink mixed into them, represent scuds that are mating. So when the water temperatures hit the 50s in the spring, you’ll tend to see some pink in your scuds, which is actually a brood pouch—-their babies are a bright pink and they hold them right against their bodies. An orange scud is actually a dead scud. They’re best fished after a deep freeze—when the banks get some shelf ice. Some of those bankside scuds will die, turn orange, and float down the river. Those are best fished in the middle of the water column, whereas most other times you want your scud rolling along the bottom. MC: Let’s say someone is planning a trip to a scuddy spring creek and wants to tie a bunch of bugs. What are some things to keep in mind? MW: Well, one thing to remember when adding accents of color, namely pink or orange, is to tend toward the softer tones. A lot of the scud dubbings out there are shockingly bright and fluorescent, and I find they’re often too bright for our spring creeks. As for the other elements of a fly, one of the things to keep in mind about scuds is that they’re very active bugs—-active movers, active swimmers–so a scud pattern should have a bit of action in it. They have a ton of legs, and when they swim those legs are going to be moving. Because of this, anything tied with ostrich herl, filoplume, or picked-out softer dubbing works great. I know some guys who just wrap some filoplume around a hook shank and call it a scud. MC: And what about hook type? 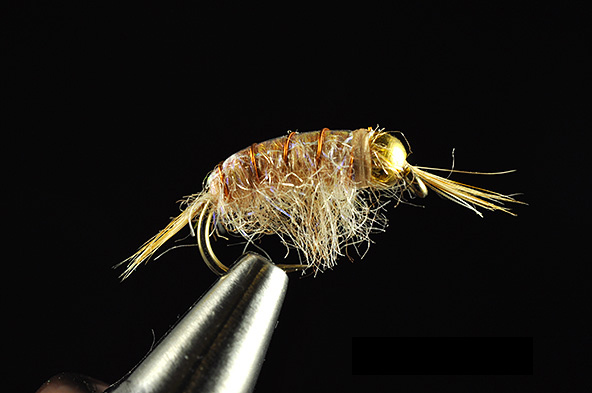 I usually tie on “scud” hooks–they’ve got quite a curve–but a notice that a lot of the flies in your shop are tied on straight-shank hooks. MW: Right–most commercial scuds are tied on a curved hook—-that’s the shape a scud takes when it’s in a defensive posture. Which is definitely not a majority of the time. When a scud is swimming, they actually straighten their bodies out. So it’s good to have scuds in both styles—-those tied with a curved shank as well as those tied on a straight-shank hook. MC: Word on the street is you’ve got a new secret weapons. MW: Yeah, I’ve recently developed a weighted hotspot scud inspired by the competition guys—the Czech nymphers. Idylwilde did a real nice write up on it. There’s something about that hotspot that fish really key in on, especially in off-colored water. The final take-home message here is that trout love scuds. Clear water or dirty, early or late in the season, if scuds are present in the waters you fish, then the trout are eating them. It’s a fly you’ve got to learn to fish, and fish well.